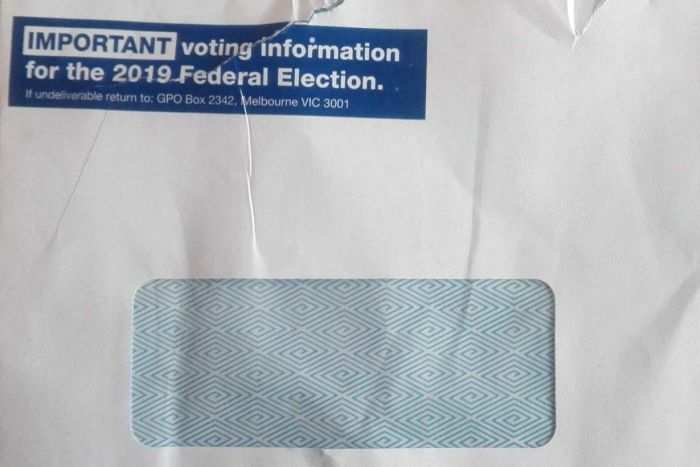 Over the next few weeks, you might spot a letter marked “IMPORTANT voting information” for the 2019 Federal Election that looks official, and contains a postal vote application form asking for personal details. But they’re not from the AEC. The unbranded envelopes have been landing in people’s mailboxes for the past few weeks, and contain a reply-paid envelope along with the form. 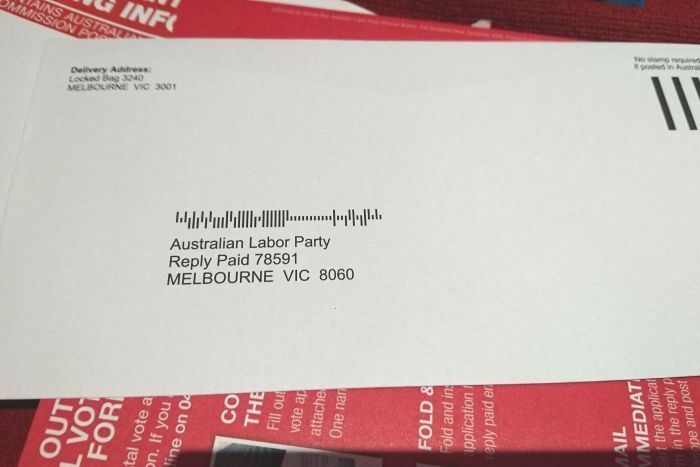 A number of recipients have told the ABC they thought it was an official letter from the Australian Electoral Commission (AEC), until they opened it to find campaign material inside. The AEC has warned if you choose to fill out these forms and mail them in the supplied envelopes, they will not be sent directly to the AEC. Instead, they’ll be sent to your local candidate, who may open your application before forwarding it to the AEC for processing. Both the Liberals and Labor are deploying them — the ABC has seen them in at least five states so far. 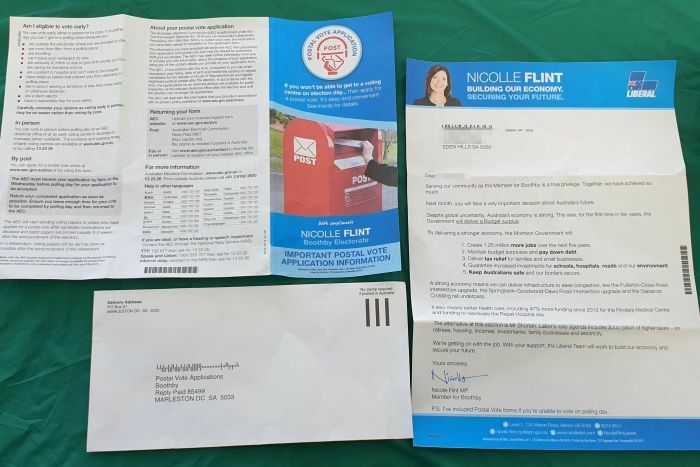 According to the Commonwealth Electoral Act — which sets out all the rules for elections in Australia — political parties are allowed to distribute postal vote applications to electors, along with reply-paid envelopes addressed back to them. “This is a longstanding provision of the electoral act,” the AEC’s director of media and issues management, Phil Diak, said. But voters aren’t required to apply or to use the envelope supplied if they do. Tweet by AEC: Please note that political parties are allowed to send postal vote applications to electors, however you don’t have to use it. Or you can return it directly to us. “The applicant may instead choose to send a completed party-supplied postal vote application direct to the AEC,” Mr Diak said. So why do political parties send them out? Political parties spruik postal votes as an easy and convenient way to vote if you can’t make it to a polling booth on election day. But there is speculation data could be added to parties’ internal databases, which they use to target you in the lead-up to the election. Knowing how old you are, your full name, and even your security question could give a local candidate useful insight into who’s living at that address, before they knock on your door. They’ll know what to bring up, or send you campaign material that’s tailored to your interests, in a bid to capture your vote. What happens if people post their application in the reply paid envelope provided by your candidates? Is the party transferring or recording that data on another system, before sending the application on to the AEC? What data is being recorded? What is that data then being used for? What provisions do you have in place to keep that data secure? The party provides applications for postal votes to the AEC. All personal information is handled according to the legislative requirements required by the Privacy Act. The Labor party did not respond before the ABC’s deadline. Is it legal for parties to check out what’s on the form? Yep. Mr Diak said there was nothing stopping political parties from “extracting and viewing” your postal vote application, if it’s sent back to them in the envelope they supplied. What’s that security question about? When you apply for a postal vote, the AEC asks you to provide a security question and answer, which it will then use to verify your vote. “When you receive your postal vote you’ll be asked to write your answer on the envelope containing your ballot papers,” the form states. In what town/city were you born? What company did you first work for? What was the last school you attended? “Regarding the question of privacy, this is a matter for the applicant to consider in sending an application to a party,” Mr Diak said. The Karlmann King is the world’s most expensive SUV, with a starting price of close to $2 million. The vehicle is built upon a Ford F-550 and weighs over 13,000 pounds. Its cabin includes a host of luxury features and the exterior is available with bulletproof armor. Modern Family’s Sarah Hyland is defending her decision to reveal that she wore two pairs of Spanx to the Vanity Fair Oscar Party. Sarah Hyland is finding strength amid her health battles. The “Modern Family” actress used throwback Thursday as an opportunity to motivate herself to work out, in spite of the fact that she says she’s experiencing unrelenting discomfort. “I’m putting this #tbt out there to remind myself that I can make it to the gym,” Hyland, 28, captioned a photo shared to social media, in which she is donning a gold triangle-bikini top. “Lately I’ve been making excuses because of the constant pain from health issues,” she wrote. “But no more. A woman’s body is a miraculous thing and we can do anything we set our minds to. “#summer #bodygoals here I come,” she added. Hyland was hospitalized last month after sharing on social media she was battling pinkeye and a viral respiratory infection, People magazine and E! News report. The actress has been open about her health issues and the challenges resulting from kidney dysplasia, a disease that occurs when the organs do no fully develop while in utero and can lead to chronic difficulty filtering waste from the bloodstream. As a result, Hyland has had two kidney transplants. After experiencing kidney failure, she received a kidney from her father in 2012. Her transplanted kidney was removed in 2017 and she received a kidney from her brother the same year. Ahead of Mike Mayock’s first draft as a general manager, the Oakland Raiders decision-maker is shrinking his circle of trust. Mayock and second-year Raiders coach Jon Gruden sent their scouts home for the weekend and do not expect them to return by draft time, sources told NFL Network Insider Ian Rapoport on Friday. According to the Raiders‘ website, they employ 14 people in their player personnel department, not all of whom are scouts. Raiders director of college scouting Shaun Herock was hired by former Raiders GM Reggie McKenzie in 2012 and served as interim GM when McKenzie unceremoniously left the organization in December. It’s unclear who will be in the Raiders‘ war room when the 2019 NFL Draft kicks off Thursday on NFL Network. On its face, this appears an unusual measure taken by the coach and GM, considering their lack of experience drafting together and the high stakes of this draft in Oakland. Some of NFL Network’s former personnel execs aren’t surprised that the Raiders would pull off this move. We never cleared the room but sometimes we’d lay traps for scouts we didn’t trust. In 1987 we showed our board to a scout with us taking Mike Junkin, a LB we didn’t like. Two days later, Cowboys beat writer Jim Dent wrote story saying we were taking Junkin. The Raiders own three first-round picks (Nos. 4, 24 and 27) and, saddled with numerous needs, have been rumored to do any and all things with that first selection (trade up, trade down, pick a quarterback, etc.). Oakland also owns the third pick in the second round, giving the Raiders four of the draft’s first 35 selections. In short, Oakland can’t afford to screw this draft up. Mayock was hired by Gruden and the Raiders after the coach pushed out McKenzie in December. A first-year general manager, Mayock previously spent 15 seasons as NFL Network’s draft guru. By kicking scouts out of Oakland’s remaining pre-draft meetings, it appears Gruden and Mayock are trying not to “mess it up” by potentially allowing leaks out of the war room. The responsibility come draft day will lie with Gruden, Mayock and few others. “The way I look at this thing from a how-do-people-perceive-me perspective is a lot of people doubted that anybody could come out of the media and go and be a GM for any team,” Mayock said last week. “I know that. I get that. In the federal appeals court Friday, the atheist didn’t have a prayer. A U.S. Court of Appeals for the D.C. Circuit sided with Father Patrick Conroy, the House chaplain, in ruling that he could not be ordered to allow a self-described atheist to offer a secular prayer to the House of Representatives. The case was brought Dan Barker, co-president of the Freedom from Religion Foundation and a former minister, against Conroy, in his official role as the House chaplain. Barker alleged Conroy improperly rejected a request to have him serve as guest chaplain. The lower court had dismissed Barker’s claim that his rights had been violated under the Establishment Clause in the First Amendment of the U.S. Constitution, which prohibits the establishment of religion by Congress, but offered its own take on the issue. In the decision released Friday, the appeals court’s three-judge panel sidestepped the legal question of whether Baker was being prevented from offering a prayer because he was an atheist, and focused instead of the content of the prayer. “Even though we accept as true Barker’s allegation that Conroy rejected him ‘because he is an atheist,’ the House’s requirement that prayers must be religious nonetheless precludes Barker from doing the very thing he asks us to order Conroy to allow him to do: deliver a secular prayer,” he wrote. The court noted that Conroy, during the litigation, had changed his explanation for blocking Barker from his initial argument that he was not a recognized or ordained religious figure. In other words, the court ignored the issue of an atheist as a guest chaplain by finding that an atheist’s prayer would not, by definition, be a religious prayer. House rules have authorized daily prayers as part the body’s official proceedings since William Linn, a Presbyterian, was named the first chaplain in 1789. Ryan quickly reversed course Thursday in a showdown that included Conroy’s allegation of anti-Catholic bias by Ryan’s chief of staff. Sen. Mitt Romney, the former GOP presidential nominee, condemned President Donald Trump after reading the special counsel Robert Mueller’s Russia investigation report on Friday. “I am sickened at the extent and pervasiveness of dishonesty and misdirection by individuals in the highest office of the land, including the President,” Romney wrote in a statement on Friday afternoon. Romney, who famously excoriated Trump on the campaign trail in 2016 and later considered joining his administration, took particular issue with Trump campaign aides welcoming help from Russia. Trump hit back repeatedly, calling Romney “one of the dumbest and worst candidates in the history of Republican politics,” and a “dope” who “choked like a dog” when he lost to Obama in 2012. But just a few months later Romney met with the president-elect on multiple occasions, reportedly angling to become Trump’s secretary of state.